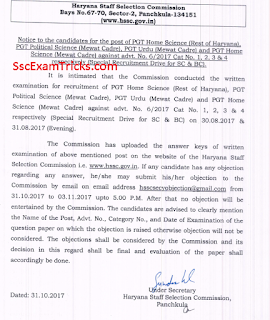 Latest news on 13th August 2018 Haryana Staff Selection Commission has released interview schedule for the post of PGT political science mwt PGT Urdu Mewat and will be a post. The document verification along with interview has been scheduled in the month of September 2018 at HSSC this number 67 70 Sector 2 Panchkula at 9 a.m. The interview call letter will be uploaded on 1st September 2018 call official website for the interview which has been scheduled on 4th September 2018. HSSC Latest News is that PGT/ VLDA Answer Keys has been uploaded for all sets of question papers on official website www.hssc.gov.in. The Answer Keys for HSSC PGT Teacher viz Political Science, Urdu & Home Science subjects can be downloaded from the link given at the bottom of the page. Answer keys for Exam held on 30th & 31st August 2017. Objection of Answer Keys can be submitted from 31st October to 03rd November 2017. The objection will be submitted through email only. The result may be available within 45-60 days after the declaration of HSSC PGT/ VLDA Answer Keys 2017. 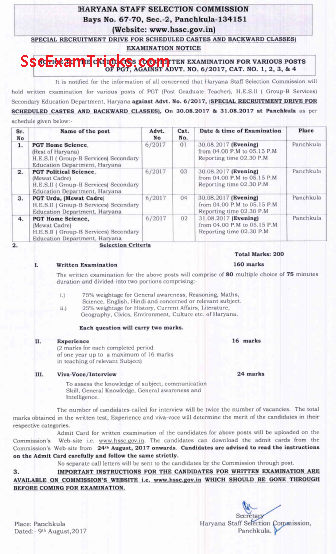 The good news is that Haryana Staff Selection Board has uploaded the notice for examination to be held for Haryana PGT/ VLDA Advt. No. 6/2017 on official website. The written exam scheduled to be held in August 2017 has been displayed in the table at the bottom of the page. The online admit card will be available on 24th August 2017. · PGT Home Science - M.Sc. Home Science with 50% marks and B.Ed. · PGT Political Science- M.A Political Science with 50% marks and B.Ed. · Cast certificate and other certificate etc. 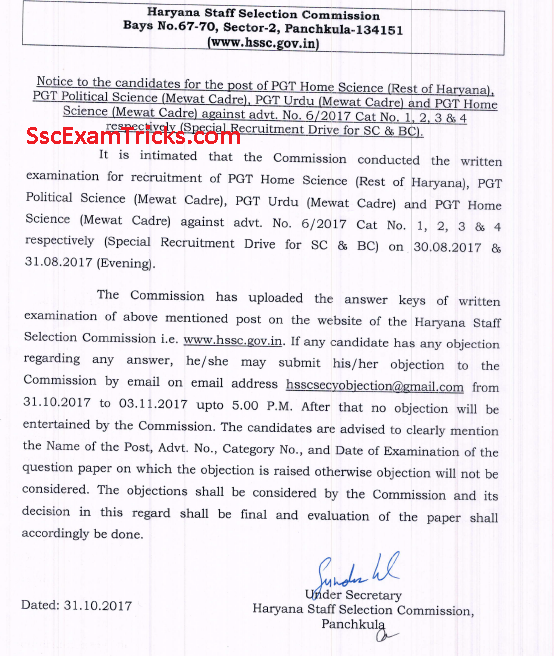 Click here to get Haryana JBT/ PRT Interview Result of Additional HTET 2013 Merit List for Mewat & Non- Mewat Districts. · Download Haryana HSSC PGT Recruitment Notification Advertisement 02/2014. · Click on direct link to apply online application form. · Fill the particular in online application form. · You need to be careful to provide information about district name, filling name, father name spelling, and permanent address detail. · Click on the submit button given at the bottom of the page of online application form. · Print e-challan to make the payment of online application for HSSC 1271 PGT posts. 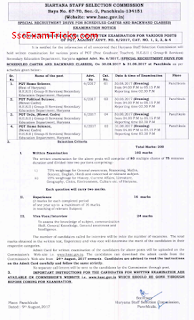 · Print Hard Copy of HSSC 1271 PGT Recruitment 2015. You can download official notification from direct link given here. The candidates must be PGT in respective subject and HTET/ STET qualified for these PGT posts. You are advised to read official notification to determine age limit, relaxation in age of reserve candidates, education qualification in detail, pay scale, start date & end date of application and detailed process of how to apply online for Haryana PGT posts through official website. You can apply online application form on official website www.hssc.gov.in. · Go to official website www.hssc.gov.in. · Click on Haryana PGT/VLDA Admit card link and enter your registration and date of birth/ password. 4. PGT Urdu, (Mewat Cadre).